Whilst millions of us were watching Nadal make Murray mince out of England's favourite Scotsman on Centre Court, only a handful were watching Location Location Location on Channel 4. 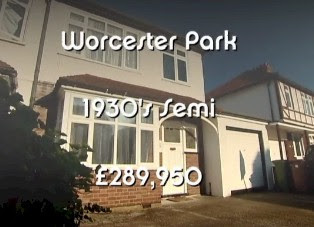 Thankfully one of that handful has been in touch to point out that this was the episode featuring Worcester Park - filmed back in the good old days when our houses were earning more than we were. Kirsty described WP as having "Good train links, good schools and a fantastic high street" whilst Phil said "As an area it's quite exciting". Quite exciting? Quite?? It's terribly exciting. He clearly doesn't read this blog. Those of you who missed it have 7 days (and counting) to catch it here. But be warned, it does contain a brief shot of The Huntsmans Hall and footage of New Malden which some viewers may find distressing. "I went into the butchers and asked if he kept dripping. He said yes it's really embarrassing!!" Feel free to add your own meat jokes here. I hope you like jamming too?